What makes a hero has been an occasional interest since the mid-1980s when I spent a year living in Sacramento. I was fresh out of college and felt lonely, disconnected, that I’d left my tribe. I had a new friend there who was a seismologist / volcanologist, and we joined a bunch of his seismologist friends for dinner one night and had the most wonderful conversation about heroism. I don’t remember any details of the conversation, but I know that I felt back in my element. It was a joyful night. It comes back to me every few years. I haven’t heard many people referred to as heroes. Usually it’s someone who has risked their own safety for another person or a cause. What would make, for example, an athlete a hero? Especially in the last few years as more scandals than heroic acts are associated with athletes. But an athlete made me want to write about heroes when I started this blog post, and a brave, nerdy professor made me want to finish it. Football player Colin Kaepernick was back in the news a couple of weeks ago. Kaepernick was the first athlete to take a knee at a game during the national anthem to protest police violence against African-Americans. His quiet act of citizenship on a national platform generated plenty of headlines. Kaepernick was deliberate when he planned his protest. He consulted with military service members to ensure respect. And yet many consider him anti-American, anti-military, and anti-flag, and he lost his job. And then Christine Blasey Ford told the world that our miscreant president’s Supreme Court nominee, Brett Kavanaugh, had assaulted her. Kavanaugh and the Republicans, mindful of Anita Hill, tried to reframe Blasey’s action— without belittling her claim — as “trying to ruin his life.” Well no, that wasn’t actually the point. No one would put her own or her family members’ lives at risk to call someone a sexual predator. It was a courageous act to give us a complete picture of a nominee who would exercise significant control over the law in this country for the next 30 years. I’m writing this the week after Blasey’s testimony and Kavanaugh’s confirmation, and I’m angry. 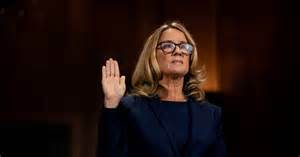 I’m angry at the men who seriously thought Ford ruined Kavanaugh’s life, when he got a Supreme Court seat and she got death threats. I’m angry that there are so few consequences for men who use their power against women. That some men think sexual innuendos or groping a woman are always good for a laugh, no harm done. I’m angry about all the #metoo moments I’ve had, and every woman’s had, when we didn’t report anything, because who would we report it to? And I’m angry that a football player who quietly and respectfully protests police racism is pilloried. I’m angry that in 2018 he still needs to protest police racism. I’m angry that in 2018 we still need to have any conversation about racism. The always-wise, suddenly fashionable Fred Rogers said "We live in a world in which we need to share responsibility. It's easy to say ‘It's not my child, not my community, not my world, not my problem.’ Then there are those who see the need and respond. I consider those people my heroes." Like Kaepernick and Blasey. They had everything to lose, and nothing to gain by speaking out. Do we need heroes? Oh hell yes. Kaepernick’s and Blasey’s heroic acts aren’t without headlines, but we need public heroes too. They remind us what bravery looks like, and that taking a stand matters. Irreverent bonus material: This is even worse than I remembered. Please remember that forgiveness is an ordinary virtue. Angry chick bonus material: speaking of taking a stand at the expense of a career, this is what I listened to the weekend of Kavanaugh’s confirmation, after Blasey’s testimony that gave so many of us flashbacks.